Shattering your dreams since 1996! Whether you’ve been on the receiving end or the sender of a blue shell in Mario Kart, the phrase on this enamel pin relates either way. The ideal gift for the experienced racer in your life. It takes some time getting use to the controls of a new console, especially when they’re so teeny tiny! Inspired by the classic SNES system comes this retro Joy-Con grip that slides perfectly onto any single controller. Drive males absolutely crazy as you flaunt this Game Over dress. Inspired by the Game Boy Color, they’re available in a range of vibrant colors and creates a surefire way to make sure you never run out of creepy Facebook stalkers. Want some retro swag, but can’t find the NES Classic Edition console anywhere for a reasonable price? You just need this NES hoodie! Although you may have to blow into the hood to get things working before you try it on first. Yahaha! You found me! With a height of 30cm, these hand painted resin figures are perfect for any collector! Custom make your own by choosing the body, face and base, making your Korok totally unique and suited to your tastes. Now your drinks can be infused with courage, wisdom, and power! Reserved only for a Hero of Time and their legendary beverages, these fun silicon ice cube molds lets you create Triforce shaped ice cubes. Da Da Daa DAAA! Cool off with Kirby! 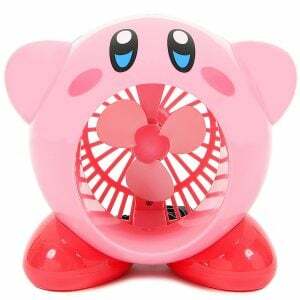 From Japan comes this USB-powered fan that takes the shape of Kirby opening his mouth up wide as he blows refreshing, cool air your way. The fan is the perfect size for your desk or workspace. Gamers can now take their Mario Kart battles to the streets of Monopoly! In this brand new edition of everybody’s favorite board game, instead of traditional money players use coins and characters each with their own unique abilities!